The Yamaha EMX2 is a 10-input powered mixer with an integrated 500W amplifier, four mic/line inputs, three stereo line inputs, and an independent monitor bus. The mixer features a Hi-Z guitar input on channel four and each channel offers a 3-band EQ for custom tailoring your sound. Channels 1/2 offer XLR inputs, while channels 3/4 include an XLR-1/4" combo jack. Channels 5 through 10 provide 1/4" inputs, with channel 7/8 offering an additional set of stereo RCA inputs. Channel 9/10 also include an 1/8" stereo mini-jack for connecting portable music players. AxcessAbles XLR-XLR20 is an affordable 20ft low-noise shielded cables with professional grade XLR male/female connectors. The exterior of this balanced audio cable has a soft PVC jacket and is hand-soldered with care to the XLR connectors. 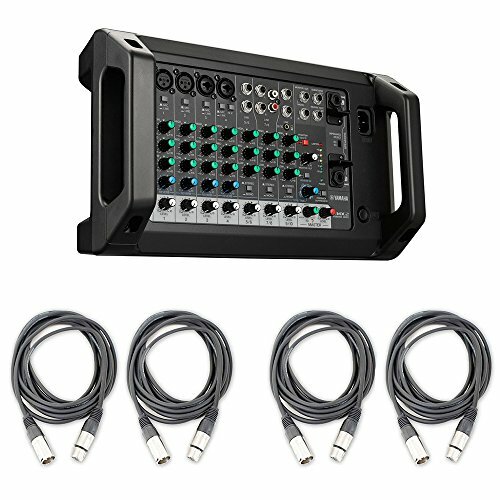 They are designed for recording and mixing use with equipment such as microphones, mixers, and studio mnitors which requiring connections with 3 pin XLR cables. If you have any questions about this product by eStudioStar, contact us by completing and submitting the form below. If you are looking for a specif part number, please include it with your message.